Skin peels are quick and easy ways to say goodbye to dry, dull, discolored skin and hello to a more vibrant complexion. 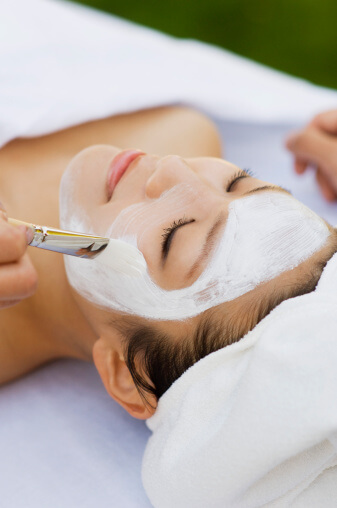 Peels use chemicals to exfoliate your skin, revealing healthier skin underneath the surface. Prepping your skin before you visit the beauty salon for your enzyme peel will help you get the best possible results. Try these strategies to make sure your skin is ready to reap the benefits of your skin peel. Facial waxing can make your skin raw and irritated, and putting a chemical peel on top of these symptoms will only make them worse. Avoid waxing for at least a week before your chemical peel, and if possible, skip it for even longer. By avoiding waxing before your appointment, you can reduce the risk of side effects and ensure your skin recovers from the enzyme peel as quickly as possible. Before a peel, don’t spend long periods of time in the sun. Wear sunscreen every day, even if you’re not going to be outside for extended periods of time, and reapply it throughout the day. If you are going to be outside, in addition to wearing sunscreen, wear a wide-brimmed hat to further shield your face from sun exposure. If you get a burn, you may have to postpone your peel. Many people feel like they have a sunburn after a chemical peel, and post-treatment redness and peeling are common. Going into the process with active sun damage will exacerbate these effects. If your skin is dehydrated when you have your peel, you’re more likely to experience side effects like redness and tingling. Make it a point to up your water consumption, and use a moisturizer on your face daily. This will help to ensure your skin isn’t dry and sensitive during your peel. Salon Nouveau offers a selection of skin peels and facials at our beauty salon in Tucson to help you achieve clear, healthy skin. Schedule an appointment for a skin treatment, massage, or hair service by calling (520) 323-0770. Copyright © 2016 Salon Nouveau, All Rights Reserved.